Rather than go into any sort of depth about any types of Fish kites in particular, this page touches on the variety of types of kites that are inspired by fish! Skim through and perhaps have a smile at something you never knew. Anyone who has been to a large kite festival would be familiar with the giant inflatable kites that are usually on display. When you think a bit more about it, you realize that most of these are actually sea creatures. Of those, quite a number could accurately be described as Fish kites. Why is this? Well, I'd say it has a lot to do with the motion of big inflatables in the wind! Designers realized early on that this motion could be very similar to underwater motion. Hence, it was only natural to make the most of it and come up with realistically moving sea creatures. 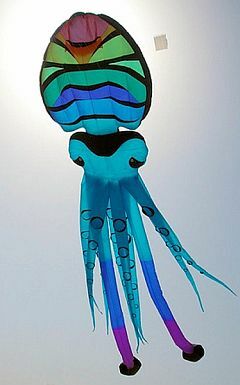 This kind of kite really looks like it is 'swimming' through the air! Some designers have excelled in this area. For example, Peter Lynn's kites feature in kite festivals all around the world. The photo over there is of a large Cuttlefish kite. Cuttlefish - see the photo! These kites are often made in several sizes. All are quite expensive compared to most single-line kites, but the smaller sizes are within reach for many people who like the idea of owning and flying an inflatable. The cost of the larger sizes can run into thousands of dollars! Not too surprising, when you consider the amount of material and the hundreds of hours of hand-assembly required. Lots of panels, lots of stitches! Western kids that is! Just about every living creature on, in or above the earth has been represented on a kid's diamond or other flat kite. The sail of a flat kite is a great excuse for decoration isn't it. The most attractive or eye-catching designs tend to out-sell the others, and you wouldn't believe how many cheap kites fly (!) off the shelves these days. The United States heads the list, with millions of kites sold each year. Naturally, fish designs pop up on these kites from time to time. Realistic, abstract, funny, gaudy or artistic, you're likely to find these flying fish, or other designs like them, in any big kite shop. 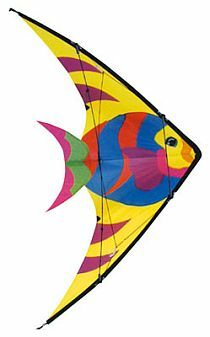 The Tropical Fish Kite in the photo is another example, although at 187 cm (72 inches) tall, it's for big kids! Like many modern flat kites, the sail is nylon and the spars are fiberglass. At about $50 U.S. it seems like a quality kite that would last a long time. It would be no trouble getting this one way up there on 150 meters of line. Photo from willofthewind.com, with permission. The 3D Mini Fish Kite. It has an appropriate appearance and outline, so in flight it looks like a fish swimming with its head aimed at the sky. Photo from sunnystuff.com, with permission. Another kite in this vein is the Fish Shape Kite. Yes, it's definitely shaped like a fish, but this time the fins are included in the sail outline. They function as little wings on either side of the fish's body. It's a 60 cm (23 inch) span flat kite with no keels. Instead, a couple of thin tails attached to the tail-end of the body provide stability. 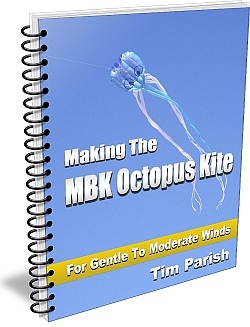 A very cheap beginner's kite, it's suitable for 8 year olds and up. I bet there are a few similar ones out there too, from other manufacturers. Photo obtained from winddancekites.com, with permission. Now, how's this for something different! 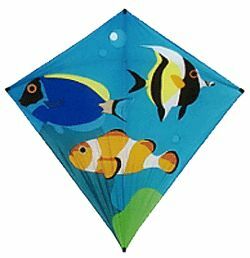 The Tropical Fish Nylon Stunt Kite is made to look remarkably like those tall aquarium fish with large fins! It even has 2 small tail fins separate from the main sail, which is a nice touch. This kite is made from the usual nylon rip-stop material and fiberglass spars. Wingspan is 122 cm, height 66 cm (48 x 26 inches). I'm sure this unusually decorated stunt kite would get quite a few second glances down at the beach, as people realize what a clever design it is. This kite would be quite a sight, racing around above the sand on its 50 meter (150 foot) lines in a stiff onshore breeze! The manufacturers say they are happy to have 8 year olds and older at the controls of this stunter. Photo from gaylainc.com, with permission. Fishing has been a way of life for generations of people in South-East Asia and the Pacific Ocean. 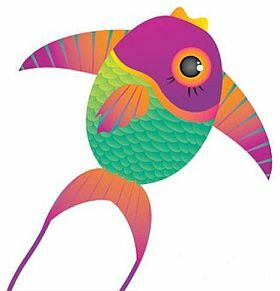 So guess what - where traditional kites are found in this part of the planet, they often represent fish! An impressive example is the Bebean, a large traditional kite from Bali. 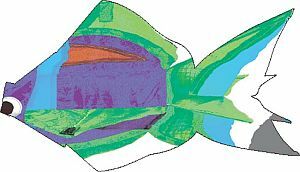 Now for an all-too-brief mention of Fish kites in China. Large books have been written on Chinese kites. There's a breadth and depth of kite design over there that's just amazing. 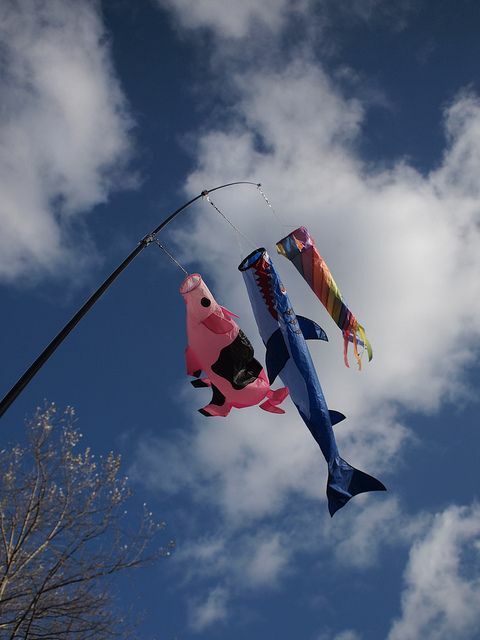 However, I'm just going to highlight one kite in particular to show that the Chinese don't mind decorating some of their kites with fish either! The photo shows a traditional Swallow kite painted with 5 fish images. This is a genuine silk and bamboo creation, measuring 97 x 87 cm (37 x 33 inches). 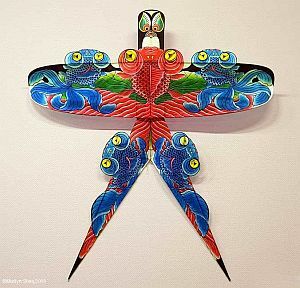 In line with the Chinese custom of considering their kites to be works of art, this kite is titled 'Five Fish'. Much more could be written just on the topic of Chinese Fish Kites, but I'll leave that for another day. Finally, a great shot of 3 Fish kites that were evidently inspired by the Japanese variety. More correctly, they are Windsocks. However, one of them looks suspiciously like a pig ;-) Come to think of it, the top one is just an ordinary spinner... Nothing fishy about that one either! Somewhat appropriately, the best place to fly home-made sea-creature kites is down at a beach :-) Wait until there is an on-shore breeze, that is, when the wind is blowing across the sand from the water. The exact angle really doesn't matter.